"Clan Jade Falcon engages Clan Wolf Units on Blackstone in an attempt to secure a staging area for further operations." "Clan Jade Falcon attempts to take Oberon VI from Clan Wolf on. The Hyperpulse Generator located on Oberon VI is still nonfunctional." 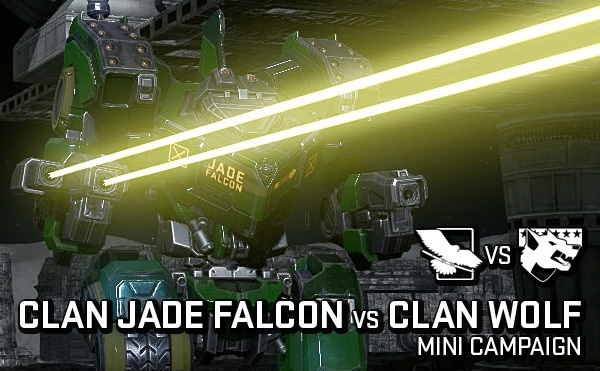 "Clan Wolf units report Clan Jade Falcon Disrupting refinery operations on gas giant "Odin" in the Sigurd System"
"Local Sigurd colonies report increased Clan Jade Falcon presence. Clan Wolf, caught off-guard by the attacks, plan to retake settlements"
"Jade Falcon shows the intention to capture Butte Hold III. This time there will be no easy Victory for Clan Wolf"
TSP Owners receive 250,000 C-Bills Per Challenge Completed!